Scientists have improved upon a new camera technology that can image at speeds about 100 times faster than today's commercial cameras and could enable the imaging of ultrafast processes involving neurons, combustion, and stars. The new technology also opens a host of new possibilities for studying extremely fast processes such as neurons firing, chemical reactions, fuel burning or chemicals exploding. 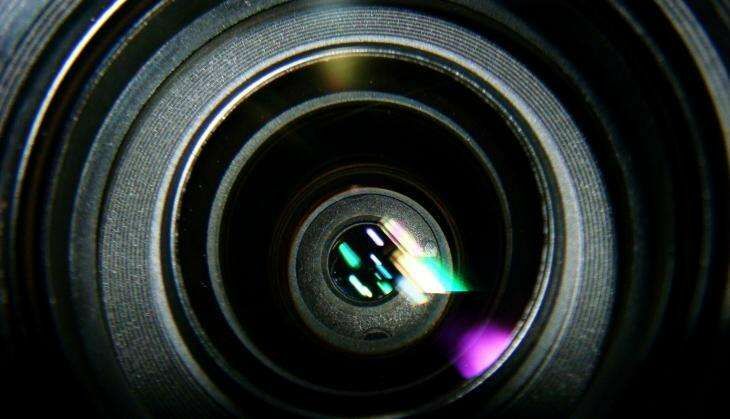 Researchers led by Lihong V Wang, from Washington University, previously developed a single-shot compressed ultrafast photography (CUP) camera that can image at speeds of 100 billion frames per second in a single camera exposure - fast enough to capture travelling light pulses. It is the world's fastest receive-only camera, meaning that it can use available light for imaging and does not need additional illumination from a laser or other light source. The new method improves the resolution and quality of images captured with CUP. They demonstrate the CUP upgrades by capturing a movie of a picosecond laser pulse travelling through the air and also by pointing laser light onto a printout of a toy car to create a movie of the light reaching different portions of the car at different times. Researchers are particularly interested in understanding how the brain's neural networks operate. Using the new camera with a microscope could allow them to watch neurons fire by capturing extremely fast chemical processes called action potentials that travel through an axon at speeds that can reach more than 100 metres per second. "We want to use our new camera to study a living animal's neural network in action. This would reveal how the neural network functions, not just how the neurons are connected," Wang said. The improved image resolution and quality means that the camera could better capture entire action potential events, including the initiation of the action potentials, propagation with varying speeds, and the termination of signalling. "Biological reactions can occur very fast, faster than standard cameras can image," said Wang. "When people study events like that now, they use a pump-probe method, which requires them to repeat the event many times," he said. "Our camera can be used for real-time imaging of a single event, capturing it all in one shot at extremely high speeds," he said. Since the camera can image with just the light available it could be used with telescopes to record activities of a supernova occurring light years away. Wang said that the CUP camera could, for example, add high-speed imaging to space telescopes such as the NASA's Hubble Telescope that have high spatial resolution unperturbed by the atmosphere. The camera would also be very useful for other applications such as imaging explosions. The study was published in the journal Optica. Half Yearly Report: Nivin Pauly, Dulquer Salmaan and Unni Mukundan delivered 2 hits each at Kerala Box Office! READ NEXT >> Half Yearly Report: Nivin Pauly, Dulquer Salmaan and Unni Mukundan delivered 2 hits each at Kerala Box Office!